Secil Tuncalp & Jagdish N. Sheth, University of Illinois | Predictive efficacies of the Rosenberg, Fishbein and Sheth models of attitudes were tested in a comparative study of predicting consumer’s attitudes toward brands of shampoo. Four different criteria of predictive efficacy were utilized. (i) Generalizability–variability of predictions across different attitudinal objects; (ii) Consistency–variability of predictions across different measures of attitudes; (iii) Stability–variability of predictions across different samples; (iv) Reliability–variability of predictive validations. Without a single exception, the Sheth model produced significantly better correlations with consumer’s attitudes toward hair shampoos on each of the above four criteria. The better predictions with the Sheth model are attributed to truncation of scales, retaining multidimensionality of beliefs and more realistic wording of the questions. In the early history of attitudes, most of the research can be categorized as essentially definitional and descriptive. A new phase emerged in attitude research with the publication of Thurstone’s work (1928) which attempted to quantitatively measure attitudes and to psychometrically scale attitudes toward specific objects such as the church. Considerable imaginative research has followed since Thurstone in which scholars in social psychology have attempted to build operational models of attitude structure by conceptualizing about factors which determine a person’s attitude toward an object or concept (See Bem 1970; Fishbein 1967; McGuire 1969; and Triandis 1971). 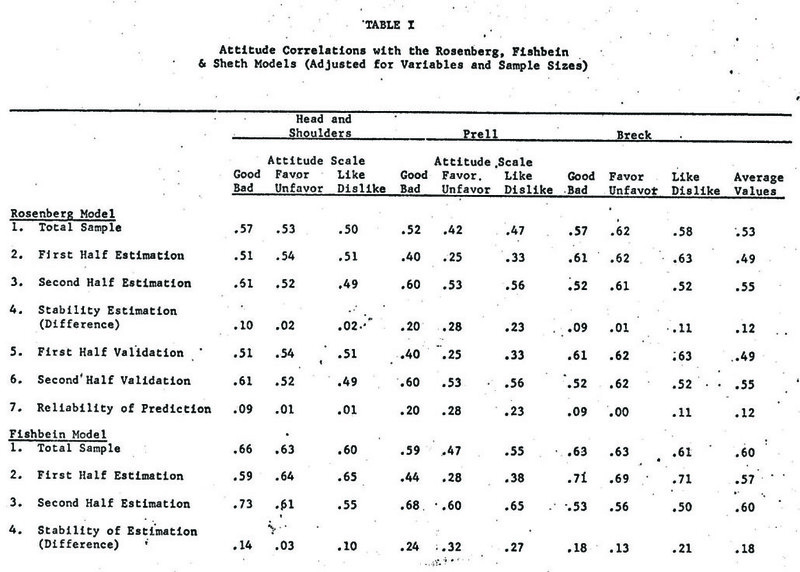 Among the more popular models are the Rosenberg (1956, 1960) and the Fishbein (1963, 1967) models of attitudes. 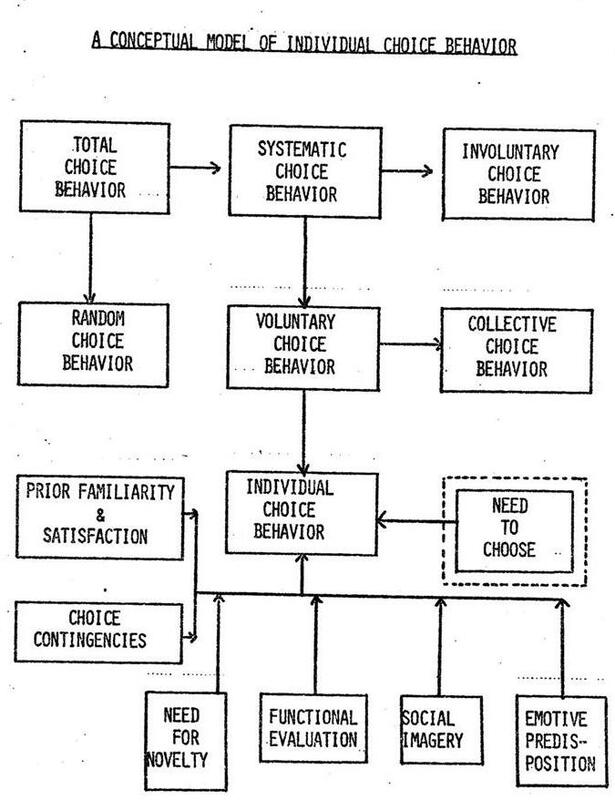 According to Cohen, Fishbein and Ahtola (1972), these models are part of a generic class of attitude models based on cognitive psychology which presume an expectancy-value formulation of attitudes: an individual has a positive or negative feeling (attitude) toward an object or concept because of his cognitive expectations about the object’s capability to do certain things and the perceived values he attaches to those things. Unfortunately, there is considerable controversy in social psychology about the form and superiority of various models of attitudes (Rosenberg 1968). 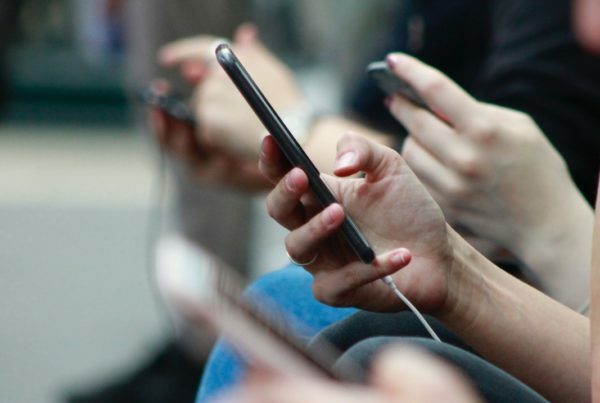 In consumer behavior, research on attitudes can be classified into three categories: First, the bulk of research consists of direct and sometimes indiscriminate applications of the attitude models developed in social psychology. This is especially true of the Rosenberg and the Fishbein models which have been applied to predict brand preferences and brand choice behavior (Wilkie and Pessemier 1973). 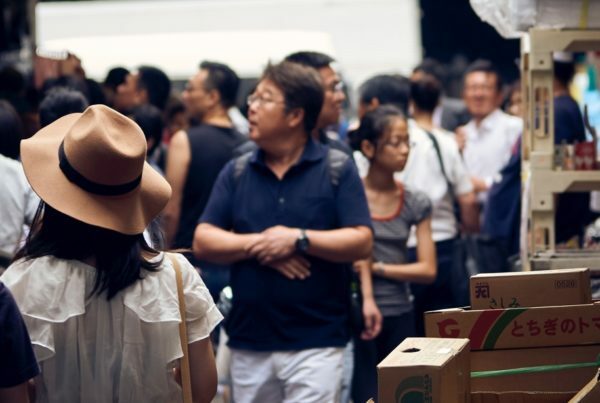 To us it appears that this type of research suffers from the same problems we experienced in the fifties and early sixties when personality theories and stochastic models were directly applied in consumer behavior. Second, some researchers have consciously attempted to reformulate and adapt the expectancy-value models to make them suitable to consumer behavior (Bass and Wilkie 1973; Cohen and Ahtola 1971; Day 1971; Raju and Sheth 1974; Sheth and Talarzyk 1972; Sheth 973). Finally, only a handful of researchers in consumer behavior have formulated their own models of attitudes by working backwards from consumer behavior to behavioral sciences and judiciously choosing and integrating the diverse concepts and theories of attitudes in pure disciplines (Banks 1950; Howard and Sheth 1969; Sheth 1969, 1971, and 1974; Myers and Alpert 1968; Alpert 1971). The dominant characteristic of these indigenous models is lack of allegiance to any specific school of thought or to a specific model in social psychology. In an applied discipline, the researcher is often on the horns of dilemma: should he extend a model developed and tested in other discipline to his area or should he develop his own model? It is relatively easy to apply other people’s models especially if those models are operationalized and measurement instruments are available as is very true with personality tests. An the otherhand, there is always that nagging feeling whether the models from other disciplines are relevant at all, and if so, how much. In consumer behavior, we have witnessed similar dilemmas in the areas of personality research and mathematical modeling of brand loyalty (Sheth 1974a). Often the only way to get off the dilemma is to carry out comparative research and measure the efficacies of the borrowed and the indigenous models. Our objective in this study, accordingly, is to investigate the relative efficacies of the borrowed and the indigenous models of attitudes. Specifically, this study examines the predictive efficacy of the Rosenberg and the Fishbein models of attitudes which represent the popular borrowed models, and the Sheth model of attitudes which represents the indigenous model in consumer behavior. 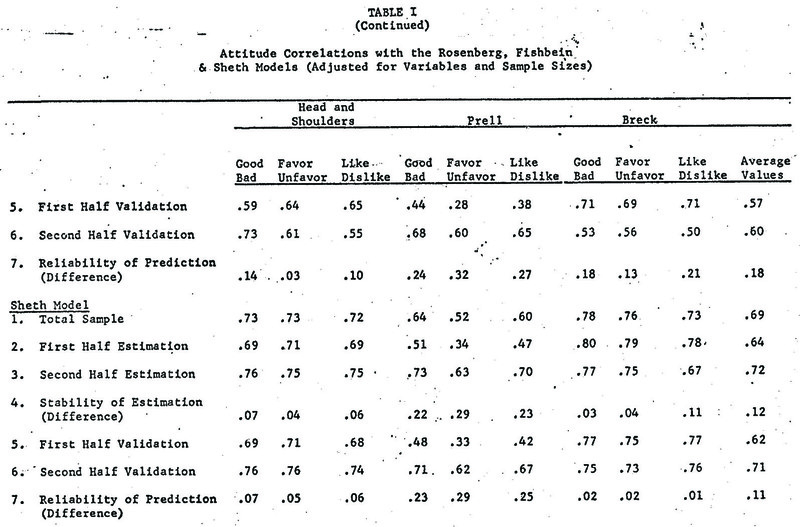 Predictive efficacy of attitude models can be measured in at least four different ways. First, does one model in a comparable situation perform consistently better over other models across different attitudinal objects? This is a test of the generalizability of the superiority of one model over other models. Second, does the model perform consistently better over other models across different but highly related measures of attitudes? In other words, if we measured the individual’s positive or negative feeling (attitude) toward an object in several different ways, does one model consistently predict better over other models? Third, does one model perform better over others across different samples of observations? Specifically, how stable are the models when subjected to random sampling errors by way of split half sampling procedures? Finally, does one model consistently predict better than others when applied to a new sample? In other words, what is the reliability of model prediction across different samples? Conceptually and operationally, there are several differences between the Sheth and the Rosenberg-Fishbein-type expectancy-value models of attitudes. First, the cognitive beliefs underlying attitudes in the Sheth model are restricted to only those aspects of the brand which represent potential of the brand to satisfy consumer buying and consuming motives. In other words, the object or concept is looked upon strictly as a goal-object based on the functional and the learning theories of attitudes. The Rosenberg model, at least in social psychology, has always dealt with more fundamental and nonproduct specific goals or valued states. While Fishbein’s model is specific to the object with respect to the beliefs, the beliefs are not limited to only those beliefs which represent linkage between product attributes and consumer’s motives. In this study, however, we have utilized comparable sets of beliefs among the three models in view of the fact that researchers in consumer behavior have liberalized the Rosenberg and the Fishbein models to focus on the brand as a goal-object where the goals are buying and consuming motives. Second, both the Rosenberg and the Fishbein models explicitly weight each belief respectively by its relative importance and evaluation. Both the models have, therefore, two cognitive components and operationally the relationship between the beliefs and the values are defined as inter-active or multiplicative. In the Sheth model, the cognitive beliefs are limited to the brand potential profile or the assessment of the brand’s capability to satisfy a number of buying criteria. Of course, the one component Sheth model will be less costly in terms of data collection because it is more parsimonious. Third, and perhaps the most significant difference between the expectancy-value models borrowed from social psychology and the indigenous model is with respect to the assumptions about the dimensionality of the cognitive structure underlying a person’s attitude toward an object or concept. Both Rosenberg and Fishbein sum the weighted beliefs and thereby presume that the cognitive structure underlying attitudes is unidimensional. This is parallel to Thurstone’s thinking about attitudes. On the other hand, the Sheth model presumes multidimensionality of cognitive structure allowing for the number of underlying dimensions to vary from product class to product class. If the consumer is satisfying a single motive, the Sheth model presumes that the dimensionality of the cognitive beliefs will be reduced to one. The number of dimensions is, therefore, clearly a function of the complexity and multiplicity of buying motives. More the number of uncorrelated and independent motives in a buying situation, the greater will be the dimensionality of the cognitive structure underlying attitudes. The fifth and the final difference relates to the usefulness of these models to public policy or industry decision makers. In the expectancy- value models of the Rosenberg and Fishbein type, it is not possible for the decision maker to identify a particular belief which he should control, manipulate or change in order to bring about attitude change. This is because the beliefs are aggregated into a single sum score. While this sum score may be very strongly related to a person’s attitude toward an object, it is impossible to identify the relative contribution of a specific belief in determining a person’s attitude. In the Sheth model, this problem does not exist. After reducing the brand potential profile to its underlying dimensions, the Sheth model directly relates each type of beliefs to the overall positive or negative feeling allowing for individual contributions of the belief dimension. Furthermore, by doing the dimensional analysis on the original profile of brand potential, the model provides two additional advantages to the decision maker: (i) it tells the decision maker which beliefs are redundant and, therefore, have high correlations among them. For example, often taste and flavor have a very high correlation in edible products. The decision maker is, therefore, free to choose only one of a group of highly correlated beliefs to manipulate, control or change for each dimension of brand potential. This avoids duplication of appeals and even enables him to consider segmentation strategies along the lines of the number of independent dimensions underlying the consumers attitude toward his product; (ii) it removes the problem of multicollinearity when the belief dimensions are statistically related to the attitude of the person toward the product. Since each dimension is orthogonal, the beta coefficients in multiple regression are not confounded by the collinearity problem and, therefore they are directly interpretable. The data analysis consisted of regressing attitudes toward Head and Shoulders, Prell and Breck shampoos, as measured by three different ways (good-bad, like-dislike and favorable-unfavorable opinions of the brand) on the cognitive components of each of the three models. In the case of the Rosenberg model, this involved first calculating a weighted sum score for each individual for each brand from PIi and VIi measures as operationalized by Rosenberg. Then attitudes were regressed on this weighted sum score. The resultant regression of attitude toward the brand on this weighted sum score is by definition a simple regression. In the Fishbein model, a weighted sum score for each individual was calculated for each brand from the profile of Bi and ai scales as suggested by Fishbein. Then attitude toward the brand was regressed on this weighted sum score resulting in a simple regression. Finally, the Sheth model also entailed two steps. The first step consisted of reducing the rank of brand potential profile to its underlying dimensionality with the use of Eckart-Young decomposition procedures. Three underlying dimensions were found consistently across the three brand profiles explaining about 97 percent of the total variance. The rotated dimensions were easy to interpret; the first dimension reflected potential of the shampoo to maintain hair and scalp health (dandruff control, conditioning of hair, and scalp condition); the second dimension reflected potential of the shampoo to provide convenience in shampooing (lather, cleaning of hair, manageable hair); and the third dimension reflected the pleasantness of smell the shampoos provided. The second step entailed regressing attitude toward a brand on the three dimension scores generated in the first step. This involved a multiple regression procedure in which the beta weights estimated for each dimension (hair-scalp health, shampooing convenience and pleasant smell) represented the relative control each type of benefit had in determining a person’s attitude toward a brand of shampoo. As can be seen from the results, the Sheth model has consistently higher correlations across all the three brands. In fact, the correlations of the Sheth model are all significantly better than the Rosenberg and the Fishbein models. In terms of the generalizability criterion, we can conclude that the Sheth model was the best and the Rosenberg model the poorest with the Fishbein model falling in between the other two models. In general, all the three models do well in the case of Head and Shoulders and Breck but not in the case of Prell shampoo. With respect to the consistency criterion, again the Sheth model provides consistently higher correlations across all three measures of attitudes as compared to the Rosenberg and the Fishbein models In general, all the three models work best when attitudes are measured on a “good-bad” scale. Even though the Sheth model performed best of all the three models, it explained on the average only about 46 percent of variance in attitudes toward brands of shampoo. This implies that factors other than cognitive beliefs may also be determining a person’s attitude toward a product. Sheth (1974) has suggested that at least three other factors also determine a person’s attitude toward a brand in addition to his cognitive beliefs of the type measured in the expectancy-value models. First, a person may like or dislike a product strictly due to past habit which has been reinforced. In other words, the noncognitive process of classical conditioning may generate affective tendencies as suggested by Katz and Stotland (1959). Second, a person may like or dislike a product due to its social imagery which may be independent of the product attributes. Often, the social imagery is in conflict with the brand’s potential to satisfy buying motives. Finally, a person may like or dislike a product due to other motivational influences which are not specific or relevant to the product class. Howard and Sheth (1969), for example, have emphasized the important role of curiosity and novelty needs in consumption behavior. Wilkie, W. L. and Pessemier, E. A. Issues in marketing’s use of multiattribute models. Journal of Marketing Research, 1973, 10, 428-441.